How Do I Act? 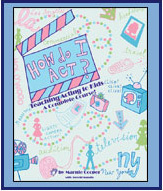 - Marnie Cooper School of Acting, Inc.
How Do I Act? is Marnie-in-a-book. It’s me right there beside you, working directly with your child through you, giving her the personal one-on-one coaching that will provide her with a genuine shot at working in television or movies, even at becoming a star. This book will teach you, the parent, how to teach your child how to act. Or you, the acting coach how to teach other people’s children how to act. And teach them up to the level at which professionals do it – so well that they will not only have a real chance at roles on television and in film, but at getting nominated for awards, and even actually winning those awards. My kids work. You’ve seen them in everything from How The Grinch Stole Christmas to Thirteen, Identity, and Dark Water; from Law & Order to American Dreams to The West Wing, Malcolm in the Middle, Joan of Arcadia and C.S.I. My kids have been nominated for Emmys, Cable ACE awards, and Tonys. I have personally taught hundreds of kids how to act over the past twenty years, kids who have worked in practically every major motion picture and television series in that time that had or does have a role for kids.